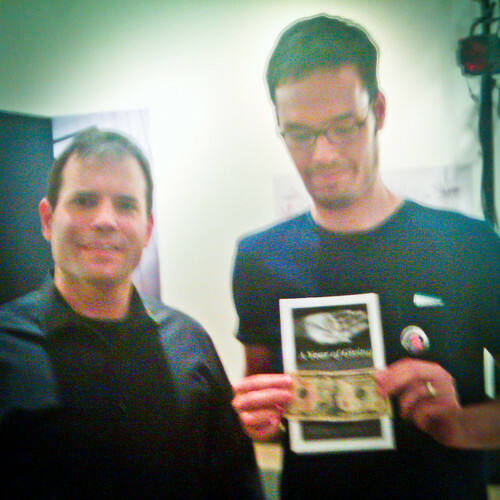 So at the show…I gave my $10 away to Jeff M. He’s a program analyst with the government – he told me which department but maybe it’s best we leave that out of the blog post. He said he wanted to do some good with the $10. I got this email from him the next day. I wanted to let you know I just donated the $10 you gave me today to D.C. Central Kitchen. I also made a $10 donation to Street Sense, another very worthy cause highlighted in the play. Thank you for your generosity and for sharing your story. I felt calm and full-hearted leaving the theater. Pretty cool. And if you’ve seen the show you know that one of the characters in the play is Robert Egger – D.C. Central Kitchen’s founder. I gave him ten bucks on Day 225! Well, I am off to get ready for our final presentation of A Year of Giving at this year’s Fringe Festival. Tickets for the show sold out yesterday – not a bad way to close out a show. I’ll drop a line tomorrow and let you know how it went and who the final $10 went to. Indeed a year of giving. Being a giver will really make you feel satisfied.